Titanium ore that only spawns in the end and is stronger than diamond. It would be very rare though. Would it have the same uses of regular diamond? Could it be enchanted? Non-converted Drowned should be reverted to always being able to drop tridents, as a way to make Tridents acceptably common without allowing people to turn Spawner-created zombies into Drowned in order to farm them. This is a stupid idea, but bring back the small roses and make them drop from rose bushes (4). Obviously you should be able to craft the bushes in the style that you craft let's say, stone bricks. Another one: let users be able to use riptide while in a cauldron (if that's even possible). Back for a third one, let us ride skeleton horses. Why? Because why not? It's not like you can't throw a saddle on those things already! It would be great for adveturers and constructing big things. Really? How do I ride them then? I actually have one nametagged in my base. I was thinking that Microsoft should add an extra armor slot. But it is no ordinary slot. You know how you have to take off your chest plate to put on the Elytra? Well with this slot you won’t have to. You can pu the elytra in that and a few other things I would like in Minecraft. Such as a backpack. How you would open it is 1. Go into your inventory 2. Under the backpack will be another button that looks like the normal inventory button. You click it and it shows you what’s in the backpack. You would craft it with a chest or shulker box, leather, and some string for the straps. Next I was thinking of a quiver to put and take arrows from. I was also thinking that you put the sword/bow/shield in this slot as well. And it would show the items on your back. this new slot would be right next to the chest plate slot. 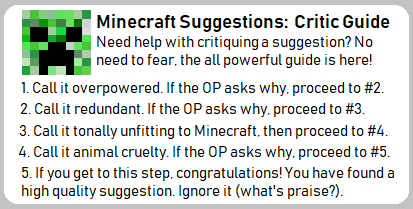 I think Minecraft forces you to choose between elytra and a diamond chestplate to add a challenging choice to the game- should you go from more defense or the ability to fly? Parrots are useless. You tame them they follow you. Mimicing mobs they encounter. Other than that...do nothing. Basically just for looks. So...useless. There for....birds should be a thing. Drowned with fishing rods can pull you into their arms with it when? Question regarding the slabs: would the bamboo sticks be vertical, or horizontal? Number 4 coming in, and I've honestly felt strongly about the game lacking this for such a long time: Forest Green dye (#228b22). Crafted with lime green and cactus green, shapeless. All dyeable blocks can use this too. Mojangcrasoft won't be adding any more dyes. 16 is a nice, round number.